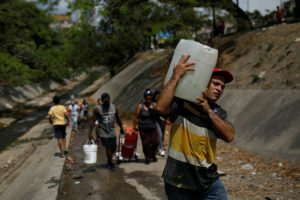 CARACAS, Venezuela — Venezuelans on Monday converged on a polluted river in Caracas to fill water bottles and held scattered protests in several cities as a growing sense of chaos took hold in a country where people have had little power, water and communications for days. The girl’s story highlighted an unfolding horror in Venezuela, where years of hardship for millions of people got abruptly worse after the power grid collapsed, intensifying the country’s long-running misery. On Monday, schools and businesses were closed, long lines of cars waited at the few gasoline stations with electricity and hospitals cared for many patients without power. Generators have alleviated conditions for some of the critically ill. There were also acts of kindness: people whose food would rot in fridges without power donated it to a restaurant, which cooked it for distribution to charitable foundations and hospitals. Information about developments across the country was difficult to gather because communications were unreliable. Engineers restored power in some areas, but it often goes out again. There have been a few protests in the Venezuelan capital, and reports of similar shows of anti-government anger in the cities of Maracaibo and Maturin. Opposition leader Juan Guaido tweeted about reports of looting in some cities, but the reports were difficult to confirm. In Caracas, some people reported more sightings of “colectivos,” a term for armed groups allegedly operating on behalf of the state to intimidate opponents. While President Nicolas Maduro and other government officials said they were working hard to restore power and provide basic necessities, the mood in Caracas was desperate. Marian Morales, a nurse working for a Catholic youth group, and several colleagues handed out diapers and food from their car, parked near a hospital. Police and men in civilian clothing ordered them to leave, saying they didn’t have permission. Early Monday, an explosion rocked a power station in Caracas. Flames rose overnight from the electrical facility in the Baruta area of Caracas. Residents gathered to look at the charred, smoldering transformers and electrical equipment. Guaido said three of four electricity transformers servicing the area were knocked out and that state engineers were unable to fix them. He has blamed the blackouts on alleged government corruption and mismanagement. Winston Cabas, the head of Venezuela’s electrical engineers union, which opposes the government, disputed government allegations that the dam was the target of sabotage. He blamed a lack of maintenance as well as the departure of skilled workers from the troubled country over the years. Maduro had accused Guaido and the United States of staging a “cyberattack” on the hydroelectric station at the Guri Dam, the cornerstone of Venezuela’s electrical grid. Information Minister Jorge Rodriguez earlier described it as a cyberattack on the dam’s operating system, which signals to machines whether to boost or diminish power based on capacity and demand. “We’re desperate,” said Luis Sanabria, a Caracas resident who joined dozens of other people collecting water at a city spring. The administration of U.S. President Donald Trump, meanwhile, imposed sanctions on a Moscow-based bank jointly owned by Russian and Venezuelan state-owned companies, for allegedly trying to circumvent U.S. sanctions on the South American country. The U.S. Department of the Treasury’s Office of Foreign Assets Control said it is targeting Evrofinance Mosnarbank for supporting Petroleos de Venezuela S.A., an entity previously targeted by sanctions in January. The U.S. and more than 50 governments recognize Guaido as interim president and say Maduro wasn’t legitimately re-elected last year because opposition candidates weren’t permitted to run. Maduro says he is the target of a U.S. coup plot. Associated Press Writer Christopher Torchia in Caracas contributed to this report.